The Neo brings the coffee shop directly to its users, serving a delicious range of high quality hot beverages. Finished in smoked glass, the angular design provides a stunning look which compliments any environment. 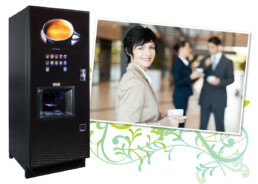 The patented in-touch selection system incorporates large icon buttons which are akin to many consumer electronic devices, making drink selection simple and quick. Drinks can be customised by the user regarding drink strength and milk and sugar levels. Once perfected the selection process can be enhanced by using the Neo Quick Code facility. This provides the user with a unique code for their optimum beverage which can be entered using the quick code function for future beverage selections. The NEO is available in many different ingredient specifications (instant, freshbrew, bean to cup, espresso and espresso barista). The varied menu includes continental coffee blends directly from the bean, fresh leaf teas, freeze dried coffees and indulgent hot chocolate drinks.